Are you ready for Christmas? I’m ALMOST ready… Everything is made and wrapped except one project… and I’m waiting on dear hubby to finish his part so I can do mine. I RARELY am this late finishing up and it stresses me out!!!! I like to be mostly done except wrapping by Thanksgiving. Not happening this year! Another factor this year was that Xanthie joined our family in August and the following two months flew by without even a thought of Christmas! I hope you saw the post from a few months ago of what I made last year for gifts! I think there were some pretty good ideas on there if I may say so myself! The turned out well and were appreciated by friends and family alike! I can’t wait to share what I’ve made this year cause I think it’s SO awesome, but I can’t… Some of you reading this would find out what your gift is before you even open it if I did that! So alas… that post will come later in the year! But I can share how I decided to wrap my gifts this year! 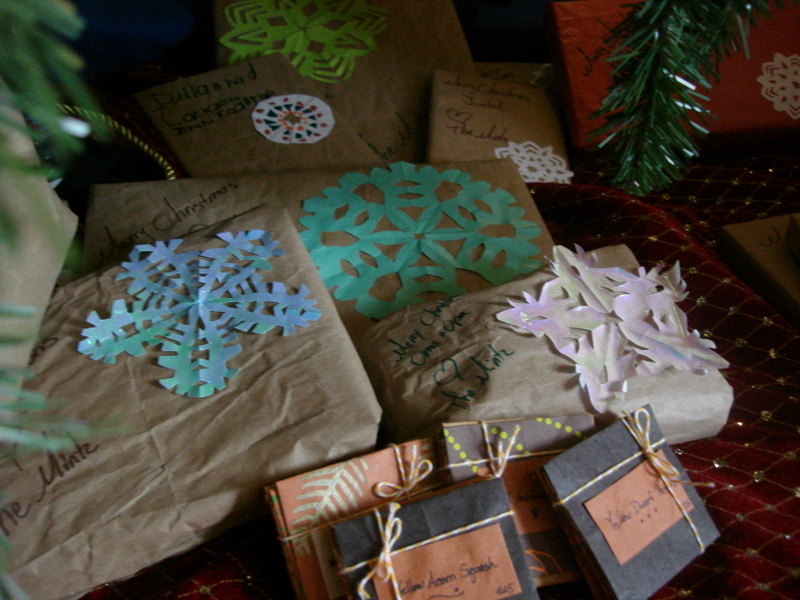 I saved brown packing paper from online orders throughout the year and used that to wrap the gifts. I then cut out LOTS of snowflakes to paste on top! It was so much fun and the boys like trying their hand at snowflake cutting… and a few of them made it onto gifts as well! It definitely took some work, but it was worth it. And an added bonus!!!! Looking at my tree and the gifts underneath looks fantastic since they are all similar! 😉 Different shapes and sizes with different snowflakes, but all the same variations in colors. Usually I have a mismatch of colors and textures and prints… but this is kinda cool! 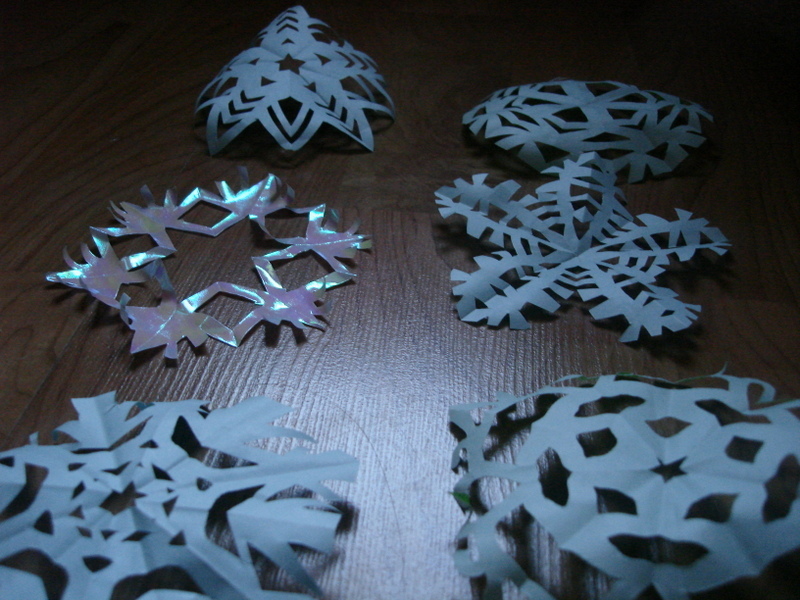 Here are a couple of links where I found some pinterest patterns for the snowflakes. I did mostly five pointed and six pointed snowflakes which was fun to change them up! In order to change the number of points you have to change the way the paper is folded. Click on either of the links above for instructions. I’m hoping I can save a few and reuse them and tape them to the windows and doors after Christmas through the remainder of the winter. Click here, here or here for a few different patterns to try! This was such a fun project and I’m super pleased with how they turned out! So with all that… I hope you are ready for Christmas and all the celebration! Next I Pray You Have a Merry Christmas! That wrapping job is lovely! You know I like a well-wrapped gift. Thanks! I was pleased with the way they turned out! AND… with that coming from you… I’m honored. I really respect your decorating abilities! You gonna share your wrapping job this year? Looking good! I love pretty wrapping! Thanks! It was a fun family project! 😉 The boys enjoyed giving it a try too! It was like opening a gift every time we unfolded the snowflake to see how it turned out!